Copy Cat Slots arrives on our doorsteps on 23rd May 2017. The game is a 5-reel, 3-row and 25 payline video slot game, with an average RTP (return to player) of 96.8% and low to medium volatility. The kitty-cat graphics will appeal to cat lovers, but the gameplay and features will surely reach a wider audience. 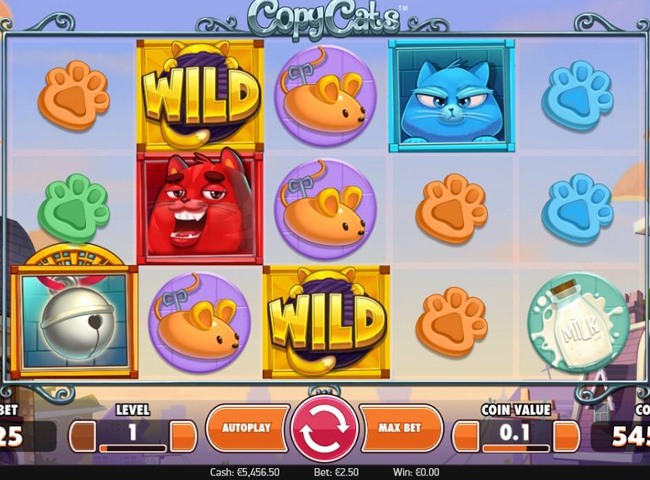 Coming out of the NetEnt software studio, Copy Cat Slots features up to 20 Free Spins, Bonus Symbols, Wild Substitutions, Stacked symbols, Stacked Wilds and an exciting Copy Cats feature that gives big winning opportunities if triggered by the Golden Cat Wild symbol. We enjoyed taking this one for a spin, and we expect that you will too. If you want to give it a go, play at one or our recommended casinos. Ok, no prizes for guessing that this slot is for the cat lovers out there. Having said that, you don’t have to be moggy mad to appreciate the graphics and gameplay presented here by NetEnt. The backdrop to the game is a neighbourhood scene, presumably the home to our friendly kitties. The reel symbols are as follows: the golden cat (Wild symbol); cat paw prints – in orange, blue, pink and green; a wind-up mouse; a half-eaten fish bone; a saucer of milk; and three cats – red, purple and blue. Aside from the Golden Cat, the key symbol is the Red Cat which will trigger a 20x stake win when appearing five times across a line. Meanwhile, the soundtrack to your spins in a jazzy affair that you may or may not wish to listen to – toggle the sound on or off in the settings area to fix this. 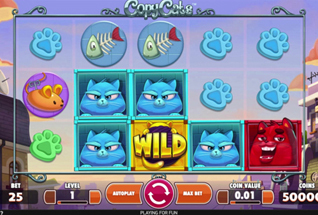 Copy Cats™ Slots offers the standard options to customise your gameplay. So, you can choose a bet value to fit with your budget by changing the Coin Value from 1p up to 50p, and the bet level from 1 to 10. This gives you a betting range of 25p up to £125 per spin. Choose carefully and make sure you set this level before you begin spinning or you might find you spend more than you anticipated. Golden Cat Wild – This is the wild symbol and will substitute for any other symbol except the Bonus. When Golden Cat appears as part of the Copy Cat feature, things get interesting. Copy Cats™ Feature – Look for any three of the Cat Symbols stacked on Reel 1 – ALL other cat symbols across the other four reels will turn into the same Cat that appears on the first reel. 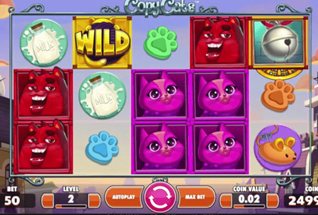 This includes the Golden Cat Wild Symbol – giving big potential winnings. 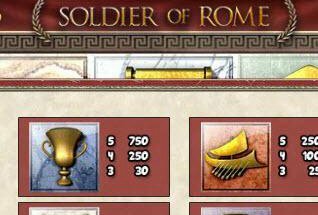 Free Spins Feature – You’ll receive 10 free spins whenever the bonus symbol (a silver bell) appears on the first, third and fifth reel together. 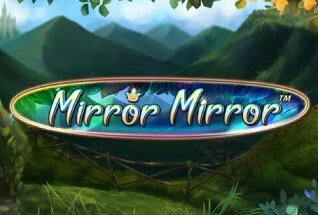 Once inside the free spins feature, you can trigger another 10 free spins by hitting the same outcome. During the free spins, ALL cats on reel 1 are Golden Wild symbols, which triggers the Copy Cat feature, opening up the chance for Mega Wins. 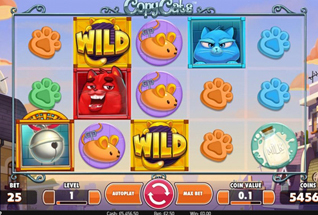 Copy Cats™ Slots has a fun theme and generates some exciting moments when the Stacked Wilds come into play on the first reel, particularly when you are in the middle of the free spins feature. 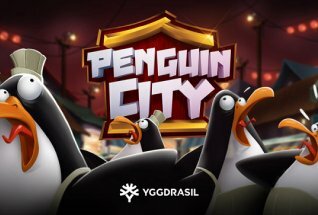 As a game with low to medium volatility, and a hit rate of 22.7%, the payouts are not so huge, and without any multipliers, Copy Cat Slots may not excite bigger, more seasoned slots players, but it is still a nice addition to the NetEnt slots catalogue, and one those with a smaller budget will definitely enjoy.